Forensic science (often shortened to forensics) is the application of a broad spectrum of sciences to answer questions relevant to the legal system. It involves the gathering, identification, and interpretation of pieces of evidence that may be used in a criminal or civil law suit. The techniques of forensic science may also be used by international agencies to evaluate a nation's compliance with agreements about weapons of mass destruction. In a more general sense, the term forensics encompasses the scholarly or scientific methodology and norms used to determine whether an object is what it is claimed to be or to determine the facts about an event. Forensic scientists utilize principles and techniques from such fields of science as chemistry, biology, physics, geology, medicine, meteorology, and psychology. They examine such items as fingerprints and samples of blood, hair, skin, toxins, and paints found at the scene of a crime. The word "forensic" comes from the Latin adjective forensis, meaning "of or before a forum or place of assembly." During the time of the Romans, a criminal charge meant arguing the case before a group of public individuals in the forum. Both the person accused of the crime and the accuser would give speeches presenting their side of the story. The individual with the best arguments and delivery would determine the outcome of the case. Basically, the person with the sharpest forensic skills would win. This origin is the source of the two modern uses of the word "forensic": as a form of legal evidence and as a category of public presentation. In modern-day usage, the term "forensics" in place of "forensic science" can be considered incorrect because the term "forensic" is effectively a synonym for "legal" or "related to courts." However, the term is now so closely associated with the scientific field that many dictionaries include the meaning that equates "forensics" with "forensic science." The "Eureka" legend of Archimedes (287-212 B.C.E.) can be considered an early account of the use of forensic science. According to the story, Archimedes was given a gold crown and was asked to determine whether it was made of pure gold (as was claimed), without damaging the crown. By measuring the weight of the crown and the volume of water it displaced, he could determine its density, which showed that the crown was not completely made of gold. The earliest account of fingerprint use to establish identity was during the seventh century. According to an Arabic merchant, Soleiman, a debtor's fingerprints were affixed to a bill, which would then be given to the lender. This bill was legally recognized as proof of the validity of the debt. The first written account in which the principles of medicine and entomology were used to solve (separate) criminal cases is attributed to the book Xi Yuan Ji Lu (洗冤集錄, translated as "Collected Cases of Injustice Rectified"), written in Song Dynasty China by Song Ci (宋慈, 1186-1249) in 1247. In one of the accounts, the case of a person murdered with a sickle was solved by a death investigator who instructed everyone to bring his sickle to one location. Flies, attracted by the smell of blood, eventually gathered on a single sickle. In light of this, the murderer confessed. The book also offered advice on how to distinguish between a drowning (water in the lungs) and strangulation (broken neck cartilage), along with other evidence from examining corpses on determining if a death was caused by murder, suicide, or an accident. In sixteenth-century Europe, medical practitioners in army and university settings began to gather information on the cause and manner of death. Ambroise Paré, a French army surgeon, systematically studied the effects of violent death on internal organs. Two Italian surgeons, Fortunato Fidelis and Paolo Zacchia, laid the foundation of modern pathology by studying changes that occurred in the structure of the body as a result of disease. In the late 1700s, writings on these topics began to appear. These included: A Treatise on Forensic Medicine and Public Health by the French physician Fodéré, and The Complete System of Police Medicine by the German medical expert Johann Peter Franck. In 1775, Swedish chemist Carl Wilhelm Scheele devised a way of detecting arsenous oxide (a compound of arsenic) in corpses, if present in large enough quantities. This investigation was expanded, in 1806, by German chemist Valentin Ross, who learned to detect the poison in the walls of a victim's stomach, and by English chemist James Marsh, who used chemical processes to confirm arsenic as the cause of death in an 1836 murder trial. Two early examples of English forensic science in individual legal proceedings demonstrate the increasing use of logic and procedure in criminal investigations. In 1784, in Lancaster, England, John Toms was tried and convicted for murdering Edward Culshaw with a pistol. When the dead body of Culshaw was examined, a pistol wad (crushed paper used to secure powder and balls in the muzzle) found in his head wound matched perfectly with a torn newspaper found in Toms' pocket. In Warwick, England, in 1816, a farm laborer was tried and convicted of the murder of a young maidservant. She had been drowned in a shallow pool and bore the marks of violent assault. The police found footprints and an impression from corduroy cloth with a sewn patch in the damp earth near the pool. There were also scattered grains of wheat and chaff. The breeches of a farm laborer who had been threshing wheat nearby were examined and corresponded exactly to the impression in the earth near the pool. Later, in the twentieth century, several British pathologists, Bernard Spilsbury, Francis Camps, Sydney Smith and Keith Simpson pioneered new forensic methods in Britain. 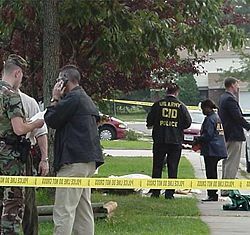 Agents of the United States Army Criminal Investigation Division investigate a crime scene. Forensic science may be divided into various subfields. A number of these are listed below. Criminalistics: It is the application of various sciences in criminal investigations, to answer questions by examining and comparing different types of evidence, such as: biological evidence, trace evidence, impression evidence (such as fingerprints, footwear impressions, and tire tracks), controlled substances, ballistics (firearm examination), and other evidence. Typically, the pieces of evidence are processed in a crime lab. Digital forensics: It is the application of scientific methods and techniques to recover data from digital (or electronic) media. Specialists in digital forensics work in the field as well as in the lab. Forensic anthropology: It involves the use of physical anthropology in a legal setting, usually for the recovery and identification of skeletonized human remains. Forensic archaeology: It involves applying a combination of archaeological techniques and forensic science, typically in law enforcement. Forensic chemistry: It is the application of chemical analyses to reveal what chemical changes occurred during an incident, and thus to reconstruct the sequence of events that may have taken place. Forensic entomology: It deals with the examination of insects in, on, and around human remains, to assist with determining the time or location of death. It is also possible to determine if the body was moved after death. Forensic engineering: It is the investigation of causes of failure or malfunction of materials, products, structures, or components. The purpose is to improve the performance or life of a component, or to assist a court in determining the facts of an accident. Forensic geology: It deals with examining trace evidence in the form of soils, minerals, and petroleum. Forensic Interviewing: This method of communication is designed to elicit information and evidence. Forensic meteorology: It is a site-specific analysis of past weather conditions for a point of loss. Forensic pathology: In this subfield, the principles of medicine and pathology are applied to determine a cause of death or injury in the context of a legal inquiry. Forensic psychology: It is the study of the mind of an individual by forensic methods. Usually, it attempts to determine the psychological circumstances behind a criminal's behavior. Forensic toxicology: It involves studying the effects of drugs and poisons on or in the human body. Forensic Document Examination or Questioned Document Examination: This discipline answers questions about a disputed document using various scientific processes and methods. Many examinations involve a comparison of the questioned document, or components of the document, to a set of known standards. The most common type of examination involves handwriting, wherein the examiner tries to address concerns about potential authorship. Some forensic techniques, believed to be scientifically sound at the time they were used, later turned out to have little (if any) scientific merit. Some of these techniques are noted below. Comparative bullet-lead analysis: This type of analysis was used by the FBI for over four decades, starting with the John F. Kennedy assassination in 1963. It was based on the theory that each batch of ammunition possessed a chemical makeup so distinct that a bullet could be traced back to that particular batch, or even a specific box. However, internal studies and an outside study by the U.S. National Academy of Sciences found that the technique was unreliable, and the FBI abandoned the test in 2005. Forensic dentistry or Forensic odontology: It involves the examination and evaluation of dental evidence, which may be presented in the interest of justice. This technique has come under fire. In at least two cases, bite-mark evidence was used to convict people of murder, but they were later freed by DNA evidence. A 1999 study by a member of the American Board of Forensic Odontology found a 63-percent rate of false identifications. Litigation science describes analyses or data developed or produced expressly for use in a trial, versus those produced in the course of independent research. This distinction was made by the U.S. 9th Circuit Court of Appeals when evaluating the admissibility of experts. ↑ Forensic Online Etymology Dictionary. Retrieved June 29, 2008. ↑ Jacques Gernet, Daily Life in China on the Eve of the Mongol Invasion, 1250-1276 (Stanford, CA: Stanford University Press, 1962, ISBN 0804707200), 170. ↑ Stuart Kind and Michael Overman, Science Against Crime (New York, NY: Doubleday, 1972, ISBN 0385092490), 12-13. ↑ John Solomon, FBI's Forensic Test Full of Holes The Washington Post, 2007, Page A1. Retrieved June 30, 2008. ↑ American Board of Forensic Odontology ABFO. Retrieved June 30, 2008. ↑ Fermanda Santos, Evidence From Bite Marks, It Turns Out, Is Not So Elementary The New York Times, 2007. Retrieved June 30, 2008. ↑ Flynn McRoberts, Bite-mark verdict faces new scrutiny Chicago Tribune, 2004. Retrieved June 30, 2008. ↑ Janet Raloff, Judging Science Science News 173(3) (2008):42. Retrieved June 30, 2008. This page was last modified on 19 April 2017, at 15:28.